After promising ‘occasional recipes’ for so long I thought it was about time I actually posted one. I’m known as a bit of a rib expert and have tried pretty much every recipe out there but none were quite perfect. This recipe has evolved over the last couple of years and they’re the best tasting ribs ever if you ask me. Perfect combination of sweet, sticky and spicy with amazing deep flavour. Of course i’m biased but everybody i’ve ever cooked them for seems to really love them too! 1. To make the marinade add your passata to a pan (if like me you forget to buy pasatta just throw a tin of chopped tomatoes into a blender and blitz until smooth). Add the garlic (crushed), star anise, Worcestershire sauce, Dark Soy sauce, Oyster sauce, runny honey and the zest and juice of a lime. Finely slice your chillies and add to the pan as well. * (Use as little or as much chilli as you like, I like them HOT so I use 2 red and 2 or 3 green finger chillies which makes a really spicy sauce. When i’m cooking for other people I tend to use just 1 of each). 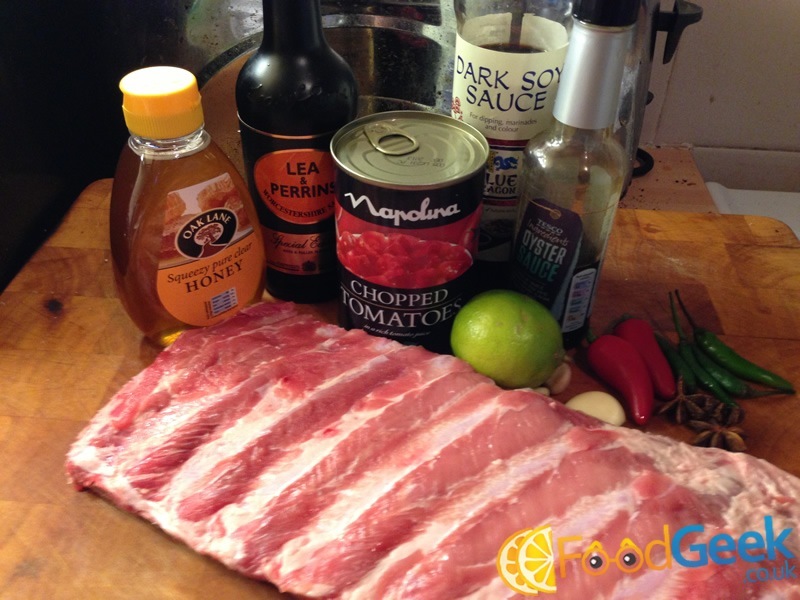 Alternatively use a teaspoon or 2 of chilli flakes. 2. Bring to the boil and leave to simmer for a few minutes, stirring well to combine all the flavours. Then remove from the heat and allow to cool. 3. Whilst the marinade is cooling trim any excess fat from your ribs and add to a large roasting tray. Once your marinade has completely cooled pour over the top of the ribs. Turn them upside down a couple of times. Cover and leave in the fridge for up to 24 hours. Turn them over occasionally. 4. Take the ribs out of the oven a couple of hours before you plan on cooking them to bring them up to room temperature and preheat your oven to 150° C.
5. Cover the roasting dish with foil and cook in the over for around 3 hours. 6. After this time the meat should be falling off the bone but they’ll look anaemic and like they’ve been boiled. Take the foil off, pour as much of the sauce as you can into a small pan. 7. 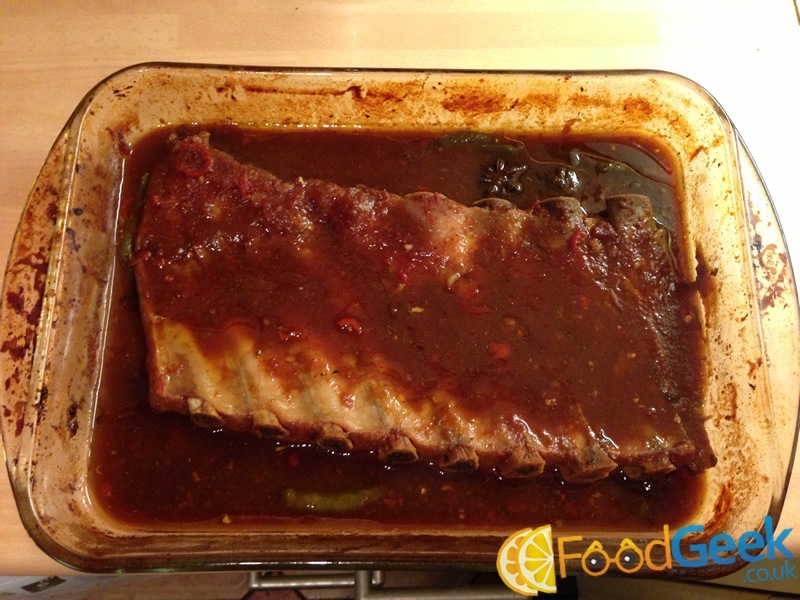 Put the ribs back in the oven uncovered for another 30 – 40 minutes, turning half way. This will blacken and charr them. 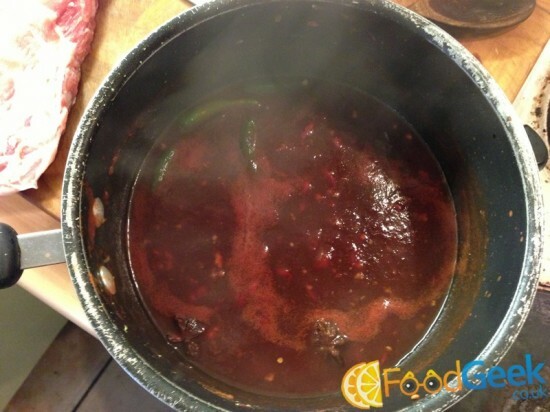 Gently simmer the pan of sauce to thicken slightly. 8. 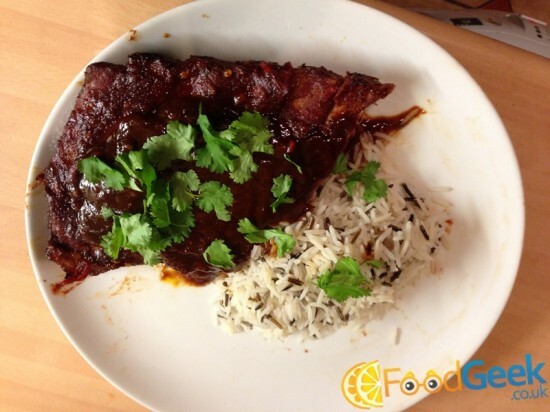 When the ribs are nicely blackened serve drizzled with the remaining sauce and topped with chopped coriander. Eat them all yourself or share them and serve with rice or wedges.